Unfortunately, in the land of FERC, there is no break for the holidays. FERC issued it's denial of our request for a hearing regarding the Conditional Certificate of Convenience (permit) for the Atlantic Bridge project. You can read the 71-page document here. 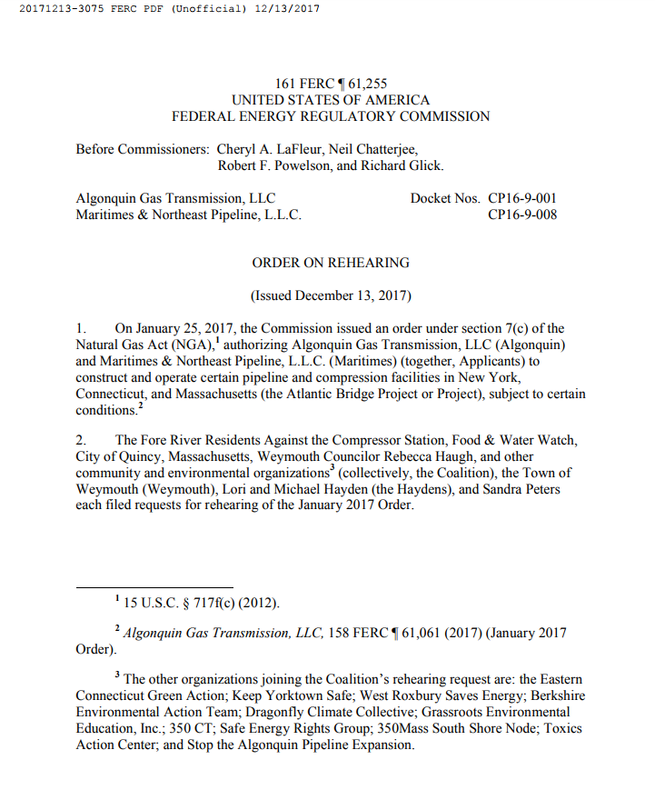 In January of this year, FERC granted Spectra/Enbridge "Conditional Approval" to begin construction of Atlantic Bridge, despite lacking a handful of permits. We hired an attorney, Carolyn Elefant and submitted a motion for rehearing soon after, in conjunction with Food & Water Watch - New England (and NY) the City of Quincy, Massachusetts, Town of Weymouth Town Council Member Rebecca Haugh and eleven other regional and local community and environmental organizations. We are consulting our attorney today to determine next steps, so please stay tuned for more info. The fight is not over.